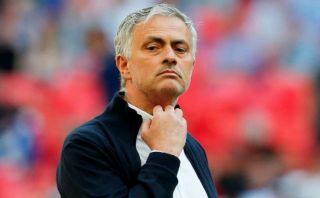 Manchester United manager Jose Mourinho was full of praise for the performance of Ruben Neves in Wolves’ midfield today in the 1-1 draw at Old Trafford. The Red Devils took a 1-0 lead through this well-worked Fred goal in the first half, only for Joao Moutinho to level for the visitors after the break. And discussing the game afterwards, Mourinho talked up the way both Neves and Moutinho dominated in midfield with their intelligent pressing work against his side. This could raise one or two eyebrows given recent transfer rumours linking the highly-rated Neves as a potential target for Mourinho’s side. Arguably a side in need of more in midfield, the Sun claimed MUFC were eyeing up the young Portuguese star, who is rated at around £60million by his club. While Mourinho was probably only offering an analysis on today’s match, it bodes well for United fans who do want to see their club sign this top talent that their manager was so quick to show how impressed he was by him today. ‘These two Portuguese boys (Neves and Moutinho), they are both the kind of player that likes to bite, that likes to short distance, to press, they don’t give long time for you to have the ball, to turn, one touch, two touches, you don’t have much of that,’ the 55-year-old is quoted in the Metro.